The biggest release in Tons of Rocks history! KISS & DEF LEPPARD & VOLBEAT + more than 20 bands ready for Tons of Rock 2019! YOU WANTED THE BEST; YOU GOT THE BEST! No bands have been more influential on the hard rock scene, and given generations so much joy and excitement with their fantastic shows as KISS. After 45 years the rock’n’roll legends announced that they will do their last tour ever in 2019 – The End of the Road Tour, and 27th of June they will take their biggest show ever to Tons of Rock. It will be a historic evening on Ekebergsletta in Oslo to remembered for years to come. Legendary Def Leppard are also confirmed for Tons of Rock 2019. The Brits has sold more than 100 million albums, and recently they finished their stadium tour in USA with an impressive 1 million tickets sold. They are one of only 5 bands in the world to sell more than 10 million albums on two different albums, Pyromania and Hysteria. On Friday 29th of June they take their massive show to Tons of Rock. The biggest release in Tons of Rocks history, from 27-29 June 2019. 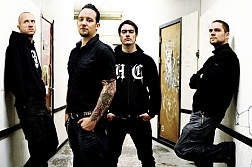 "Volbeat confirms Festivalshow 2019 - britishrock.cc"